When it comes to getting the word out about your issue, cause, or organization, there are three types of media you can use: owned, paid, and earned. Paid media is, simply put, advertising. Owned media are the channels, tools, and content that you control. At one point, that meant your brochure or newsletter. These days, those tools run the gamut from your website, blog, and e-newsletter to the latest social media fad (Vine, anyone?). The third type of media, earned, is considered the holy grail of media. Traditionally, earned media has been defined as the visibility you earn when a journalist reports on your issue, cause, or organization. It is coverage in newspapers, on the radio, on TV. Typically, you or your organization orchestrate a strategic news moment, which you share with reporters through news conferences, press releases, or just targeted pitches. It’s not free media. You earn it — not only through the newsworthiness of your story, but through the sheer work it takes to land coverage. 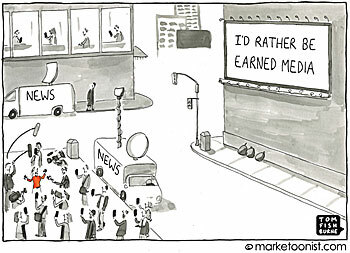 In today’s digital age though, the definition of earned media has expanded. It’s no longer just what reporters are saying about you. These days, you also earn visibility through blogs, email, shares, and social media interaction and engagement — in other words, online content. This is earned media 2.0, and it’s more powerful than ever, accelerating visibility and conferring third-party credibility on your news. There are two reasons for the evolving nature of earned media. One is that we are all media publishers now. At one point, only media companies and journalists generated content that people could consume. Now, with the advent of Twitter, Facebook, Instagram, blog platforms, and so much more, everyone can amass an audience. The only distinction these days between traditional media companies/professionals and everyone else is audience size. Mass media reaches a larger audience size, but even that has shifted. Remember when everyone made a big deal about Ashton Kutcher having more Twitter followers than CNN? And that was 2009. The second reason is that technology and the web have dramatically changed how we consume news. The days of sitting in front of the television for the evening news or waiting to read about the news of the day from the morning paper has passed. Now, we encounter news pretty much all day long, on multiple platforms (our smartphones or tablets, our desktops or laptops, via search) and from multiple sources (our favorite podcast, our high school friend on Facebook, or our favorite niche blog). If the definition of earned media has been redefined, we now have to rethink our media strategies as well. Traditional media relations is no longer enough. Organizations and causes have to embrace the power of their own media channels in order to tell their story and engage their stakeholders. Our media strategies must integrate owned media outreach with media relations. That means 1) developing email content or blog posts along with press releases and targeted pitches to media. It means 2) prioritizing a social media strategy with graphics or other content that encourages sharing and engagement. During the media monitoring phase, it means 3) tracking not just the hits we get in papers or on the news, but also whether we’ve sparked conversations on social media or on blogs. And it means 4) using owned media or paid media to create an amplification loop that feeds off of any earned media 2.0 coverage that was generated. A great example of this type of integrated strategy is United We Dream’s “Operation Butterfly” campaign, which successfully combined traditional media outreach with great use of owned media engagement for maximum impact. Finally, it means 5) building it before you need it. A segmented email list, a website with a blog or a section on your website that can be continuously updated, and consistent engagement on social media channels are now necessary owned media ingredients of an organization’s ongoing communications strategy. By spending time building engagement across your owned media channels, you’ll be well positioned to score with earned media 2.0 when strategic news opportunities hit. Bilen Misfin Packwood is a 13-year media veteran who has worked as a journalist and PR professional, including a stint leading communications for Kamala D. Harris, San Francisco’s former district attorney, before founding Change Consulting. Bilen turned her observations about earned media into a Ted-style talk at SPIN Academy South 2012. Follow her blog at and on Twitter @bmisfin.